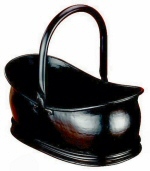 The Astley log bucket is designed for holding logs or coal. Enhance the look of your fireplace with this useful log bucket. Makes an ideal gift.